The client is a rail company in the Nordics that operates a Tetra network for Push to Talk radios and data with a number of remote base stations and two central sites. Tetra is a radio system typically used to provide the communications infrastructure for critical services such as police, military, and other emergency services. Staff such as platform assistance personnel use the network to contact central locations for information and assistance in case of emergency or other issues. Telecommunication service providers are discontinuing leased line services used by Tetra networks to backhaul radio traffic to central sites. The Motorola Radio equipment currently connects to a leased line and the radio traffic is backhauled over the TDM network to redundant central sites where there is Motorola Radio network control equipment. The customer wants to continue using their existing Motorola equipment. The existing TDM network will be replaced by an IP network without the need to replace the Motorola equipment . This has been achieved by placing a Virtual Access device at the base stations, the base station leased line interface is moved from the existing network interface device to the Virtual Access gateway. 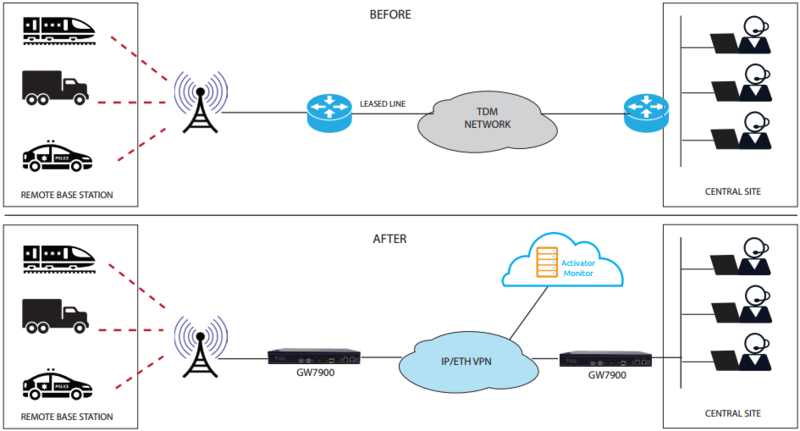 The Virtual Access gateway converts TDM to an IP stream and the traffic is sent over a secure IP network to the central sites where the Virtual Access central site gateway converts the traffic back to TDM.